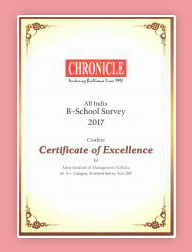 Army Institute of Management has received the Certificate of Excellence and has been placed in the A++ category in the current B-School Survey by Chronicle. 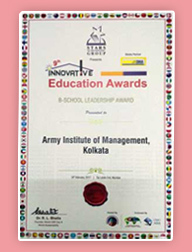 Army Institute of Management (AIM), Kolkata has received B-School Leadership Award, conferred by Stars of the Industry Group at the 9th Innovative Education Awards, held on 18 Feb 2017 at Taj Lands End, Mumbai. 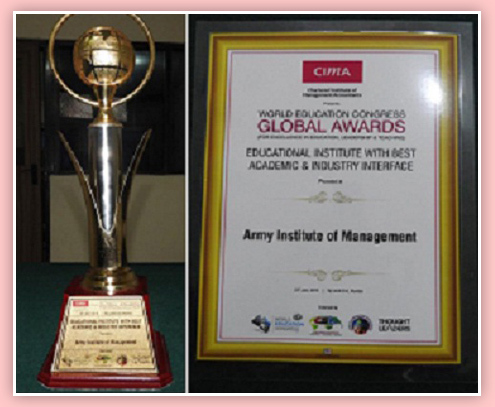 Army Institute of Management (AIM), Kolkata has been declared as the Recipient of “World Education Congress Global Award” for the year 2016 in the Institutional Award Category of “Educational Institute with Best Academic & Industry Interface”. The World Education Congress was a platform, in which participants discussed "Evolving Trends in Education". The Congress examined modern as well as traditional knowledge systems. The Congress further explored how education can help develop mental, emotional and physical skills to help facilitate personal excellence as well as psychological and socio – economic wellbeing, in the challenging times the world faces today. The Award comprising a Trophy and a Certificate was presented to AIM Kolkata at a specially organized Awards Ceremony on 23 June 2016 at Taj Lands End, Mumbai. The Award will help to build brand equity and gain global recognition. The Institute has recently been selected for Business School Affaire & Dewang Mehta National Education Award and declared the winner of “The Best B School Award” for the year 2015 for its excellence in academics. The institute has also received B-School Leadership award for the year 2015 as recognition of leadership, innovation, development and industry interface of institute.